We offer high quality, competitively priced, fast turnaround printing services from our centrally located store at 36th and South Harvard in Tulsa, OK.
We are open from 8:00 am - 5:00 pm Monday through Friday. We print for a wide variety of customers from Universities to National Brands as well as many local small to medium sized companies in and around the Tulsa area. We are unusual in that we cover both the traditional press ‘litho’ printing sector as well as being one of Tulsa’s foremost digital print operations. But above all, we offer a great service at competitive prices. 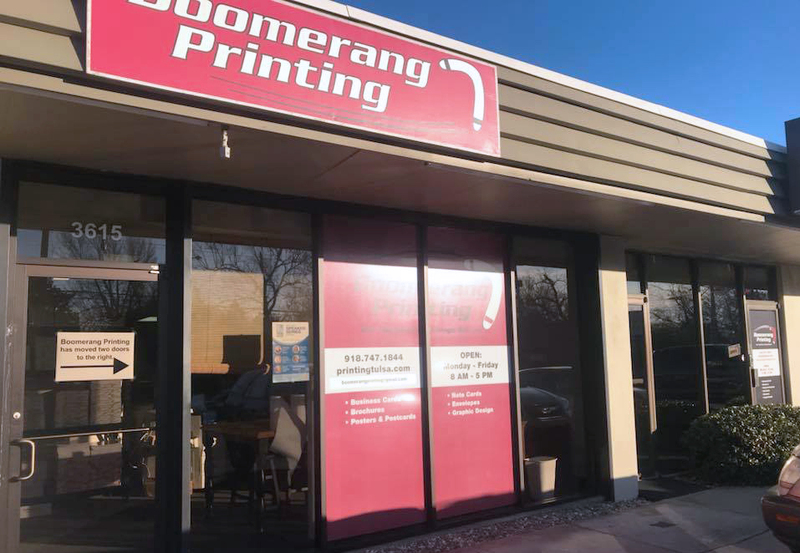 Here at Boomerang Printing we are proud to have built a solid and dependable business with over 1,000 active customers and nearly 70 years of combined knowledge working for you with our highly skilled staff. Our continued investment into staff training and equipment has enabled us to become one of Tulsa’s most popular and capable business printers. Our determination to do whatever it takes to deliver your work on time, on spec, and on budget remains as strong as the day we started. We pride ourselves on the working relationships we’ve built with our clients. Feel free to contact us today at boomerangprinting@gmail.com.